Following fan outrage over the way loot boxes have been implemented in Star Wars Battlefront 2, EA has pulled them from the game entirely just hours ahead of its release. Overnight, the ability to purchase loot boxes using real-world currency was removed from all platforms and a statement was released from EA DICE boss Oskar Gabrielson explaining the move. Gabrielson started his statement by thanking the Star Wars Battlefront community for being the “passionate fans that [they] are.” It’s entirely down to you whether your read some exasperation in that description. DICE has said it will keep fans updated on its progress around loot crates and as yet there’s no official word on when they’ll return to the game. 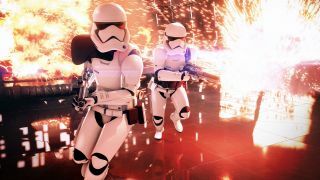 A report from VentureBeat suggests that the decision to pull microtransactions from the game was in part driven by a phone call from Disney boss Bob Iger to EA’s CEO Andrew House. It really wouldn’t do to have such negative PR swirling around the Star Wars brand this close to the release date of Episode 8. While this is a somewhat shocking solution it’s not entirely unsurprising given the build up of community anger over the past week. Loot crates and microsotransactions have always been a point of contention in gaming and Battlefront 2 fans were concerned that this game’s system in particular unfairly influenced progression and performance in matches. Feeling that EA wasn’t doing enough, particularly when it came to the cost of heroes, fans took to Reddit to complain and EA’s response ended up becoming the most downvoted response of all time. Even cutting the cost of characters wasn’t enough for EA to recover from this and the chaos around the matter resulted in the mainstream press and European Gambling Commissions getting involved. Given the degree of escalation around the matter, it makes sense that EA has hit the emergency stop button. Released today on all platforms, read our full review Star Wars Battlefront 2 review.